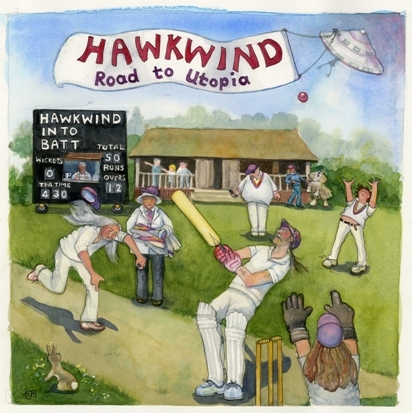 Cherry Red are pleased to announce the new album by the legendary Hawkwind, Road To Utopia. For their 31st studio album, the band have collaborated with songwriter and conductor Mike Batt to recreate a selection of Hawkwind songs with an extra, orchestral, ingredient. Mike, who met Dave Brock coincidentally at the US embassy in London while both were applying for VISAs, was originally invited to conduct the orchestra for Hawkwind’s sold-out shows at the London Palladium (November 2018), but with demand so high they started to look further afield and a tour for the autumn was planned. At this time Hawkwind’s writing of a new acoustic album started to take on a life of its own and the band invited Mike to participate on the tracks and create arrangements for some of their most celebrated songs. Mike says: “Dave was delightfully free-spirited and generous to me, using a small ensemble of additional musicians and giving me a pretty free hand with the arrangements.” Alongside the string quintet, sax quintet and brass section you’ll hear Dave Brock (vocals, electric, acoustic guitars, harmonica, keyboards), Richard Chadwick (drums, percussion, vocals), Mr Dibs (vocals), Haz Wheaton (bass) and Magnus Martin (acoustic guitar). Most will find the track listing on Road To Utopia familiar, but you’ve never heard those famous songs like this before. Tracks like Quark, Strangeness and Charm, We Took The Wrong Step Years Ago and Psychic Power are re-rooted acoustically and then embellished with a strength and majesty that only Hawkwind can produce. Other songs like Down Through The Night and Hymn To The Sun are made even more powerful by their orchestral components. Joining Hawkwind and Mike et al on The Watcher is a very special guest in Eric Clapton, whose trademark guitar licks compliment Dave’s harmonica and Mike’s piano seamlessly. This new album represents a fresh take on those classics, as Dave says: "Reinventing these familiar songs has been an interesting experience...We hope you like them." The band will be touring with Mike in October and November, including sold out dates at the Palladium in London.